2 Michael Standaert is a freelance journalist currently based in Shenzhen in South China. Standaert primarily covers environmental and climate change policy, and infrastructure developments for Bloomberg BNA, MIT Technology Review and South China Morning Post. Michael Standaert is a freelance journalist currently based in Shenzhen in South China. Standaert primarily covers environmental and climate change policy, and infrastructure developments for Bloomberg BNA, MIT Technology Review and South China Morning Post. China-underground: How has the Chinese government’s attitude towards the environment and climate change evolved? What is the “ecological civilization” in the mind of Xi Jinping? Michael Standaert: When I first moved to Beijing in 2007 air pollution was officially called fog. I’d hear Beijingers call it fog and wonder what happy pills they were taking and how could I get some. The air pollution monitoring system at the time was a joke and didn’t give anyone a good idea of real pollution levels, particularly small particulate matter [PM2.5] that’s most harmful to the lungs. The instigator of change was actually the U.S. Embassy in Beijing, which started putting high-quality pollution levels out on social media from its location on the northeast side of town. The Chinese government didn’t like this of course, but as more and more Chinese started to realize that they weren’t getting a clear picture of the problems there got to be a lot more angst out there. To be fair, China – and this was when Hu Jintao and Wen Jiabao were still running things – was attempting to shore up air, water and soil pollution controls, but things were very, very slow. This is partly because of local governments protecting important businesses, and partly the corruption that goes along with those relationships. So if you look at Xi Jinping’s major policies of cracking down on corruption and creating an “ecological civilization” they both go hand in hand actually. As for climate change policy, that’s still an open question, but the “War on Pollution” has had the knock on impact of also reducing carbon emissions at the same time other pollutants are targeted. Supposedly carbon dioxide emissions have plateaued but we don’t have a real grasp how accurate those are since this is mainly industrial emissions that are being measured and the government hasn’t put out an official inventory since 2012, I believe. That also doesn’t account for greenhouse gas emissions like methane which are likely rising due to a shale gas boom in Sichuan and other factors. There have been a lot of industrial efficiency improvements that have helped reduce energy consumption in industry and thus CO2 intensity from industry. But there are still a lot of areas that could be improved, particularly what would seem like easy things with insulation and better windows in homes. I think the average air cycling in northern Chinese homes is like nine times an hour, compared to something like two times in Europe and North America. That means you are losing a lot of heat energy. My first job in Beijing was with a state-media magazine as an editor for a year. I was always annoyed when in the depths of winter my colleagues would keep a couple windows wide open. Same in the summer, the AC would be going full blast and the windows would be wide open. They said that the air coming out of the AC wasn’t healthy. Well neither was all the polluted air coming in through the window. Xi is on the right path though. I’m still a bit skeptical about how deep that message is going. And also on climate change, Xi played the world pretty well by coming out as some kind of “climate leader” in opposition to “climate loser” Trump. For example, initially it looked like China would start its national carbon trading system in 2016, then they said mid-2017, then late 2017. They finally announced it at the very end of the year, but it is very tentative and not as ambitious as some thought it would be. It was supposed to cover eight industries, but now will only initially cover power companies. That’s a big chunk of emissions, like 30 percent I think, and actually it might be better to go slow and do it right. I also think they saw Trump signaling a pull out from the Paris agreement and said to themselves: Why hurry? Let’s slow this down a bit. China until recently was the final destination of the world’s recyclables and solid waste. Whole local economies like Guiyu have been created around the waste disposal. How could this situation change in the future? And if China stops being the ‘dump’ of the world, where will they end up? Guiyu was closed down as a destination for foreign electronics a couple years back. I was there the month that they shut it down. There were banners across the road threatening households with power cuts if they didn’t dismantle the e-waste processing shops. I had been there twice before that as well, when things were really nasty still. What I really wanted to do was track health problems of the migrant workers who worked there and went back to their hometowns. Local researchers wanted to do the same, but it proved nearly impossible. The shops wouldn’t allow researchers in to talk to adult workers and the only data they could get was blood work from hospital blood samples from pregnant mothers, so they were really only able to look at how much lead, cadmium and other stuff was getting into the bloodstreams of these mothers. The levels were quite high. Plus the migrant workers didn’t seem to care since they were making money and sending it back to Hunan, Sichuan, Anhui. And they were often only there for six months, a year, then off to somewhere else. Would be worth finding out how many health impacts these people eventually did have. I tend to believe that treating your own waste and trash should be the norm. The ability to push it off to, what was a developing country at the time – I don’t consider China a developing country anymore, but that’s another topic – causes huge distortions. If countries are forced to treat these things themselves then it would encourage more reuse, recycling, less packaging, and make consumers pay for that, then habits and awareness would change. If everything is low to no cost, then people consume, consume, consume without a care and let someone else sort it out. So good for China to stop being a dump. Where else could it go? E-waste is already being rerouted to Southeast Asia, South Asia and Africa. A big unknown at the moment is what is happening with all the domestically generated e-waste in China. There are a little over 100 official recycling centers, but I think that some of those people who learned how to do the dismantling have set up scattered shop in the interior and border areas of China now, with smaller operations, not massively concentrated like Guiyu. There is still some recycling done at Guiyu at an official recycling facility, and it isn’t a lot cleaner than before, but it is domestic waste and at a much lower scale than before. What are the benefits of the ‘Belt and Road’ project? Are there any less obvious risks? Benefits for some of these countries would be of course infrastructure, energy, economic activity. Risks are that projects could be done in some of these areas with not much concern for environmental and social impact. We’ve seen that before in China and see it outside China with some Chinese projects. I don’t want to say all. I have heard that the China-led Asia Infrastructure Investment Bank [AIIB] is really trying to evaluate projects on their environment, social and governance criteria as well as their return on investment, but supposedly they have a small staff. Another risk is just migrating pollution and that China is involved in some 100 or so new build coal fired power plants along the BRI. Should that factor into China’s carbon inventory or climate commitments? The other risks are more to China. Does it really want to have to manage projects in some of these areas where so much conflict is going on. Is it ready to? China is investing in the field of genetics, for example with gene-edited pets programs or GMS foods like transgenic soybeans. Is there already a market for these companies? What are the risks of a partial regulation of the sector? 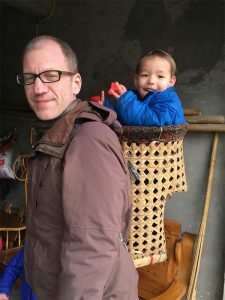 There’s a lot going on in China around genetics and gene-editing, and as far as genetically modified organisms, there’s a lot of research, but on the whole there’s not much transparency and researchers are very reticent about talking about their work. Compared to those in the West who want to get the word out about what they are doing, it feels like the opposite here. There’s no real benefit for them to talk about what they’re doing and let the general public know, since most of them are tied to institutions affiliated with government bodies and government financing, so if they said the wrong thing and it got back to them it could hurt them. There’s a real paranoia about that, I feel. How much has China changed since the first time you visited the country? I was in Beijing my first three and a half years, then in Shenzhen since mid-2010. Shenzhen has changed a lot just in those eight years. It would take too long to go into all of my thoughts on this at the moment. Just a small anecdote. A year back I started using WeChat to pay through my phone almost exclusively in China. I can buy fruit off a guy on the street by scanning his code. Around the time I started doing this I also visited my hometown in Illinois and everything felt so slow and backward, with little change or even little thought of change. There’s some good in that slowness and backwardness too, of course. But being in Shenzhen everything seems to change so fast and it can be hard to keep up with. A building goes up in an area of the city that you haven’t been to in six months to a year or so and you come there and everything looks different. I’ve lived in five different, distinct areas of Shenzhen and each one has undergone massive changes in the past few years. The convenience of living here is also top notch. I can pretty much get most things I need in a 15 minute walk radius, and if not, order it online and get it in one or two days. What advice would you give to a young person who wants to get closer to the world of journalism in China? Get used to rejection. No one wants to talk to you if they know you are a journalist. Or if they do it is heavily scripted and often without much content. Get used to using a fax machine. Many government offices and some businesses require that you fax them your questions, and stamp the paper with your official company seal. Of the hundreds of faxes I’ve had to send though, there have only been a handful responded to. This is the fax black hole. No one knows exactly where it is, but it is out there, somewhere. This process often makes you question whether your fax machine is working or not. And it can be lonely not getting a response. Best if you can work in a strong organization with a strong team. It is very hard to freelance here. More isolating than I think freelancing in other places, and I’ve freelanced from Brussels, and from the U.S. Also, this is simple, but study Chinese as much as possible when you first arrive. I didn’t do that very well. I can understand quite a bit now, and can get around with my speaking, but am not very confident with it yet for deeper or technical conversations. I think if I took three to six months off to study now, I could get up to a pretty good working level. It has been hard to find the time or money to do that in the past few years, particularly since my wife and I have had two kids in the last five years.